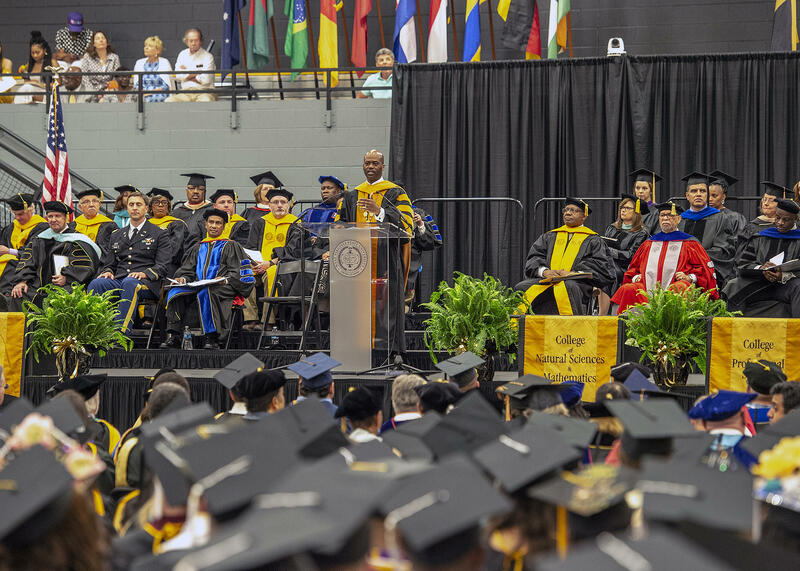 West Virginia State University President Anthony L. Jenkins speaking at the May 2018 Graduation. A five-year contract extension has been approved for West Virginia State University's president. The Charleston Gazette-Mail reports President Anthony L. Jenkins' new contract goes into effect July 1 and ends in 2023. The contract was approved Friday by the West Virginia Higher Education Policy Commission. He was first hired on a two-year contract in July 2016. A university release says additional compensation based on performance is included in the contract and will be paid by the West Virginia State University Foundation. It says Jenkins annual base salary will increase from $235,000 to $255,000. The commission also approved a five-year contract extension on Friday for Shepherd University President Mary Hendrix. The contract extension raises her annual base salary from $271,000 to around $284,000.